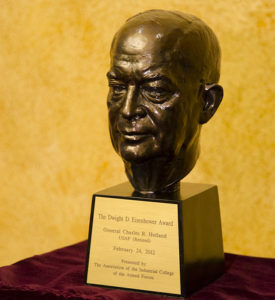 The Association of the Industrial College of the Armed Forces (ICAF) and Dwight D. Eisenhower School (ES) has begun planning for the prestigious Dwight D. Eisenhower (IKE) Award Dinner that will be presented during a dining event in early 2018. The search committee has selected two ICAF graduates – both retired four-star general officers who are current D.C. businessmen – to be considered for the final selection of this award. The IKE Dinner Committee will plan and execute the 2018 award dinner and transition the planning for a 2020 IKE Dinner. If you are interested in volunteering, please complete the form below and let us know!